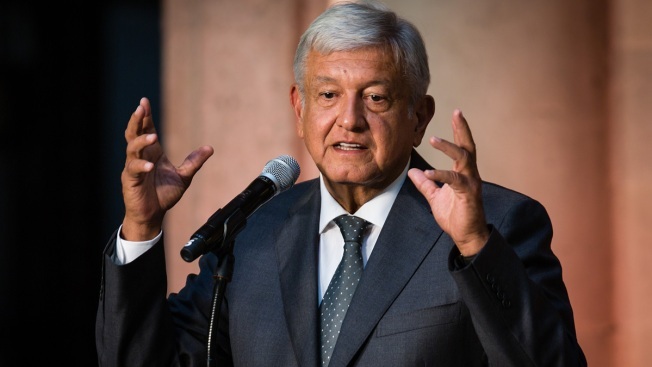 In this July 3, 2018, file photo, newly elected President of Mexico, Andres Manuel Lopez Obrador, speaks during a press conference after a private meeting with Outgoing President Enrique Peña Nieto as part of the government transition at Palacio Nacional in Mexico City, Mexico. President-elect Andres Manuel Lopez Obrador won the Mexican elections by 53% and will assume office on December 1st, 2018. President-elect Andres Manuel Lopez Obrador on Sunday released a seven-page letter he sent to U.S. President Donald Trump detailing how he plans to improve Mexico's economy and security when he takes office in December so that Mexicans do not feel the need to migrate.